← For All Things- Not Just for Fall! One of my favorite techniques in photography is when points of light are out of focus in the background. This technique, known as bokeh, can easily be copied with stamps. 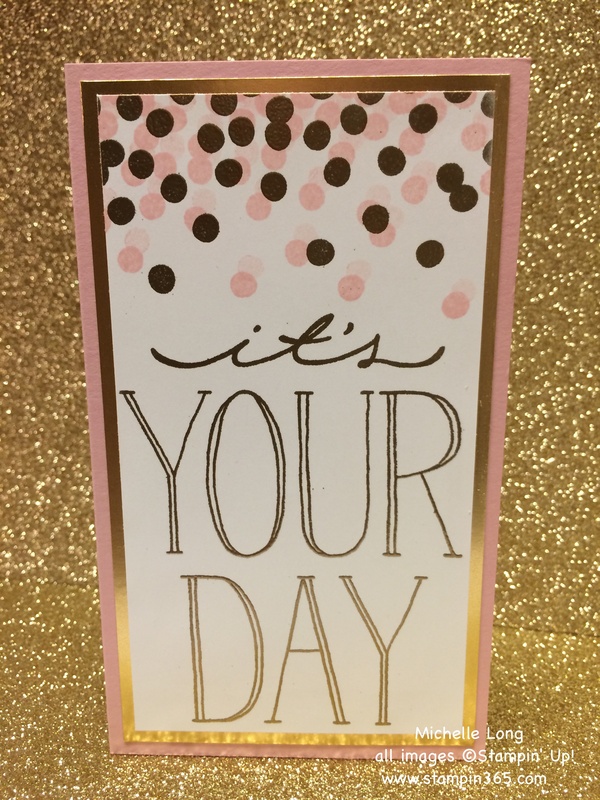 For this birthday card, I simply stamped the dotty stamp twice in blushing bride (without re-inking the second time) and once in versa mark with gold embossing powder, which I heat embossed. Each time, I offset the dotty stamp slightly. I just love how it looks like twinkly lights at the top of this card. The sentiment is a sneak peak of the fabulous new stamp set “Big On You” which will be available from the Occasions catalog starting January 6th. I am crazy for this set, which I won during the recent Occasions catalog event for demonstrators. You can learn more about any of the products by clicking on the images below. I love the card, Michelle. I’m looking forward to the new catalog release. I just hope I can find some money after the holidays to get a few of my favorite things. Thank you for another lovely comment and I hope you have a wonderful New Year!